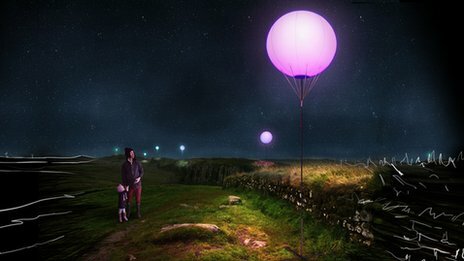 A colourful line of pulsating balloons is to light up the night sky on the 73 mile (117km) length of Hadrian’s Wall. 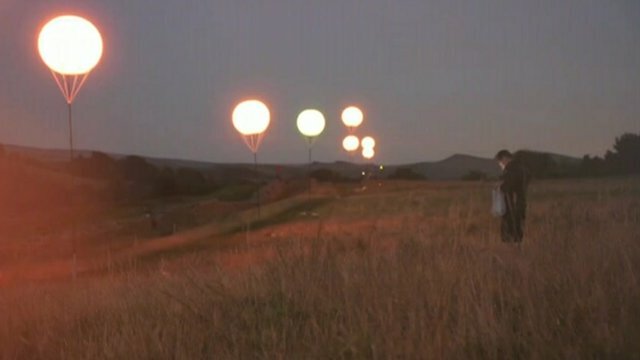 The digital art installation will see 400 balloons lined from Segedunum Roman Fort in Wallsend, to Bowness-on-Solway, as part of the London 2012 Festival. Called Connecting Light, it is designed for people to view the wall as a bridge not a barrier – described by artist Zachary Lieberman as an “inverse wall”. Mr Lieberman said the creation has “never been seen before”. Designed by New York based digital arts collective YesYesNo and founding member Mr Lieberman, the idea is to allow people to share their physical or emotional experiences and thoughts about borders. He said: “We are nerd artists who try to find a poetic way to use technology – in this case it’s LEDs and radio communication. “Hadrian’s Wall is set in amazing landscape, it’s incredibly beautiful and the other thing I love about the wall is that it goes through so many different types of environments – windswept plains, craggy rocky landscapes, straight through cities. Mr Lieberman says his work uses technology in a playful way to explore the nature of communication and the delicate boundary between the visible and the invisible. The 6ft 6ins (2m) diameter weather balloons will transmit messages between each other and internal LED lights will change colour in response – this will create a line of pulsating colours as messages travel through it. The public will be able to interact with the balloons by creating messages and selecting colours either at the site or online – directly controlling the installation. There are several sites across the wall which will be open to the public, including the Errington Arms in Corbridge, Housesteads Roman Fort and Carlisle Castle and Tullie House Museum. Linda Tutiett, from Hadrian’s Wall Heritage, said: “We want people to think about Hadrian’s Wall in a fresh new light, we want to build an audience for the wall who will care about it for the future. The Hadrian’s Wall Trust is looking for volunteers to help out at the event. Connecting Light is being produced in partnership with the Hadrian’s Wall Trust, the Cultural Olympiad programme and local partners.